Lango Camp nestles in dense rainforest overlooking the Lango Bai, a nutrient-rich swamp which attracts lots of wildlife, near the Lekoli River. The camp offers a varied range of activities including walking, boating and kayaking, allowing you to explore the rich flora and fauna of Odzala-Kokua National Park. While here you can expect to see forest buffalos, bushbuck, sitatunga, forest hogs, large flocks of African grey parrots and African green pigeons, and occasionally forest elephants usually present after dark. With a maximum capacity of 12 guests the camp never feels crowded. You have your own self-contained room with a wraparound viewing deck with views of the bai, and a private shower room with hot and cold running water plus a supply of toiletries. There's a fan in the bedroom and the whole room is set on a raised platform to aid the cooling flow of air. A wooden walkway links your room to the camp's central areas. The communal areas are set on raised platforms, so you can enjoy views into the rainforest as you relax and enjoy meals between activities. In the evening you'll gather around the camp fire after dinner to talk over they day's events, and to enjoy some stargazing from the large deck. Open: Lango Camp is open all year. Location: Lango Camp is in the south central part of the Odzala-Kokoua National Park in the north west of the Republic of Congo. Access is via the Mboko airstrip, about a 45-minute drive from the camp. The flight from Brazzaville takes 2-3 hours, depending on refuelling stops. Rooms: There are 6 rooms, accommodating a maximum of 12 guests. All have verandas overlooking Lango Bai. You have a bedroom with a fan and safe plus a bathroom with running water, a shower, flush toilet and a range of toiletries. Activities: These centre of the bai after which the camp is named, the nearby Lekoli River and the savannah. Walking and boat rides, either by motorised pirogue or kayak, combine to offer great wildlife viewing. You can also spend time in Mbomo village, usually visited when travelling to or from Ngaga Camp, to gain an insight into the local way of life. Facilities: Raised walkways connect the communal areas and guest rooms. At the heart of the camp is the cosy lounge and bar and the dining room. All are set on elevated decks overlooking the bai. A lower deck lets you enjoy star gazing after dark, in the warm glow of the camp fire. There are power sockets in guest rooms and communal areas for charging batteries. There is solar-powered electricity with a back-up generator. The camp offers a daily laundry service free of charge. Dining: Meals are taken communally with other guests. Children: Children aged 15 years and older are welcome. 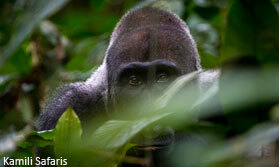 Let us help you plan your perfect tailor-made holiday to Congo. Talk to one of our travel experts. Tell us what you want, and we will tailor make your perfect trip.